Sprint Sand & Clay’s 15 locations spread throughout the Greater Houston region reduce delivery times while cutting down on transportation costs. 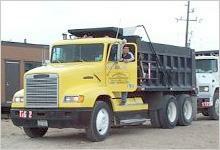 All trucks delivering Sprint products are fully insured, offering full haul-back and haul-off services. Our team of experienced professionals have assisted numerous customers with preparing for construction and building projects and landscaping. From land clearing to pond installations and pad work you can count on Sprint quality for your residential development needs. Sprint Sand & Clay is full-service commercial construction material provider, with trucking, excavation, demolition and other construction service capabilities. 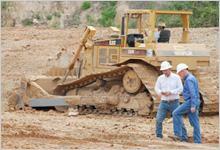 The company works hard to provide everything customers will need to start a successful build project. 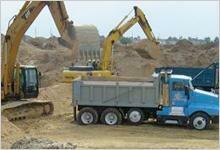 Sprint Sand & Clay designs and builds detention ponds or other drainage systems for flood control. Having multiple locations to legally dispose of detention pond dirt is another reason to talk to Sprint. Serving the greater Houston area since 1982. Sprint Sand & Clay owns and operates 20 plus active mining locations, which provide quality sand, topsoil, fill dirt, select fill, mulch and other construction and landscape materials to customers. These sites are conveniently located throughout the greater Houston area to pass on low transport costs directly to Sprint’s customers. Sprint prides itself on promptly delivering the highest quality product for any job size. Call today for a same-day quote.